Jack Wyman watches his tee shot on the 17th hole during the Paul Bunyan Amateur Golf Tournament at the Kebo Valley Club in Bar Harbor on June 8, 2014. 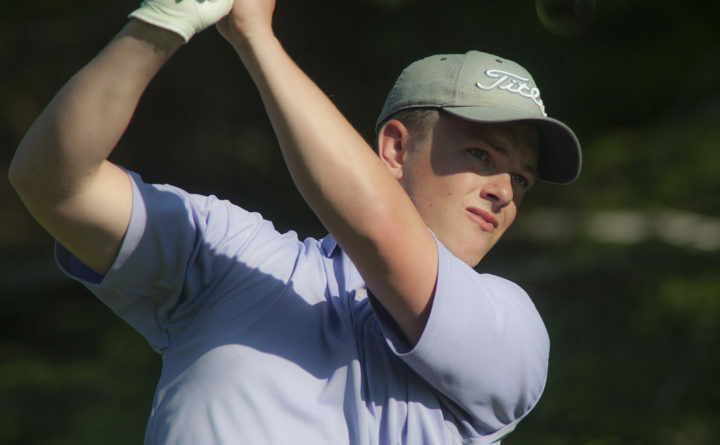 Defending champion Jack Wyman of Falmouth and the Portland Country Club fired his second straight 3-under par 68 to take a one-shot lead over first-day leader Cole Anderson at the 99th annual Maine Amateur Golf Championship at the Belgrade Lakes Golf Club Wednesday. Anderson, who will be a senior at Camden Hills High School in the fall and plays out of the Samoset Resort in Rockport, followed his opening-round 66 with an even-par 71 for a two-day total of 5-under par 137. Former Bangor High golfer Drew Powell of Holden shot a 70 to go with his first-round 68 and is just two shots back at 138. Powell plays out of the Penobscot Valley Country Club in Orono. John Hayes IV out of South Portland’s Sable Oaks Golf Club, the 2015 Maine Amateur winner, had a 69 to accompany his 70 and is three shots back. The final round will be Thursday with 42 of the 132 entrants making the cut. The cut line was 11-over-par 153. There was a three-way tie for fifth at 1-under par 141 involving Joe Baker of the Martindale Country Club in Auburn, Caleb Manuel from the Brunswick Golf and 2013 Husson University of Bangor Sports Hall of Fame inductee Joe Alvarez, who plays out of the Webhannet Golf Club in Kennebunk. The only other golfer who isn’t over-par is 2014 Maine Amateur champion Andrew Slattery from Martindale, who is at even-par 142 following a 72. Craig Chapman of Martindale and Bill Boyington of the PVCC are each at 2-over par 144. Among other notables, Logan Thompson of the Barnes Brook Golf Course in West Enfield was one of four golfers tied at 3-over par 145; Mount Desert Island High School girls basketball coach Brent Barker from Bar Harbor’s Kebo Valley Golf Club, Lincoln’s Lance Bernier, now playing out of the Boothbay Harbor Country Club and Sable Oaks’ Ashley Fifield were among five golfers at 5-over 147. Fifield shot a 69 on Tuesday but struggled to a 7-over par 78 on Wednesday. The Augusta Country Club’s Mark Plummer, who has won the Maine Amateur a record 13 times, shot a 75 and is at 7-over par 149 and 2013 winner Ricky Jones out of the Samoset Resort is at 9-over par 151. Jones was the runner-up in 2016. Wyman’s card showed four birdies and one bogey Wednesday as he picked up birdies on the first and third holes, bogeyed the seventh, and then birdied the 10th and 15th. Anderson, who has verbally committed to attend Florida State University in 2019, had a roller-coaster round with a double bogey, two bogeys and four birdies. After bogeying the fifth and sixth holes, Anderson rallied with consecutive birdies on the 10th and 11th holes and added another on the 14th. His double-bogey six came on the 15th hole, a 334-yard par four, but he salvaged even-par for his round when he birdied the 530-yard, par-five 16th. Powell, who was third in the Maine Amateur in 2014 and won the Class A state individual title that same year, started his round with six straight pars before picking up birdies at seven and eight and bogeys at nine and 10. He added two more birdies at 14 and 16 before bogeying the 17th. Powell plays golf at Brown University in Providence, Rhode Island.